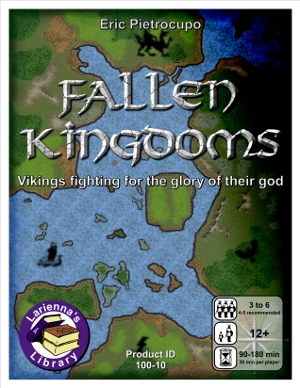 Each player is a Norse god that will control various Viking kingdoms which will evolve and change through out the passage of time. After a while, new kingdoms will invade the land to destroy the older kingdoms. This process will continue until all the kingdoms evolve enough to unite themselves as one nation. Players must try to do their best out of each civilization in order to win. They accumulate glory points every turn for each city they control and they can acquire trophies which will make them score extra points. There are three kinds of trophies, when two of them are depleted, the game ends. The player who accumulated the most glory points wins. * Possibility to use generic components to speed up the assembly. * Full color Print-Out which are also printable in black and white. * Bilingual components (french-English) but only English rules. Play time: 90 to 180 minutes. 30 min per player. Number of players: From 3 to 6 players. 4 or 5 players are recommended.